This girl loves her some snow. For us in the northeast, this winter has been brutal. What, you didn’t know that?? You haven’t seen it plastered all over the news and the interwebs? Weird. All the snow has provided me with many, many, MANY opportunities to take Sophia out back to build a snowman (Do you wanna build a SNOWWWWMAAAAAAAN?!!! 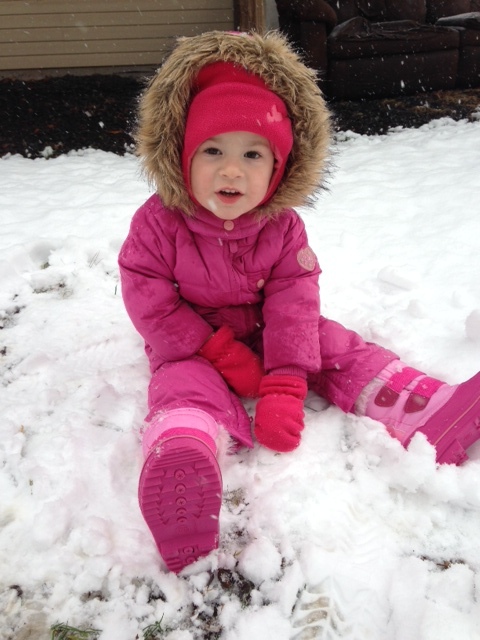 ), slide down the hill in the greatest makeshift sled of all time, and teach her how to throw snowballs like a boss. They’ve been fun. They’ve also given us insane cabin fever. But, the best part of all this snow has been Sophia’s reactions when she looks out of our bedroom window in the morning and sees the beautiful white snow covering the ground… “It’s snowing!” or “It snowed!!! !” and her eyes get so wide and her jaw drops. It takes me back to my days as a kid. Back when I loved the snow. Back when I didn’t moan and groan about yet another storm. I miss the days when snow was the best thing ever. It makes me so happy for her to love snow that much, just like I did. Our LEGO haul from mid-December. 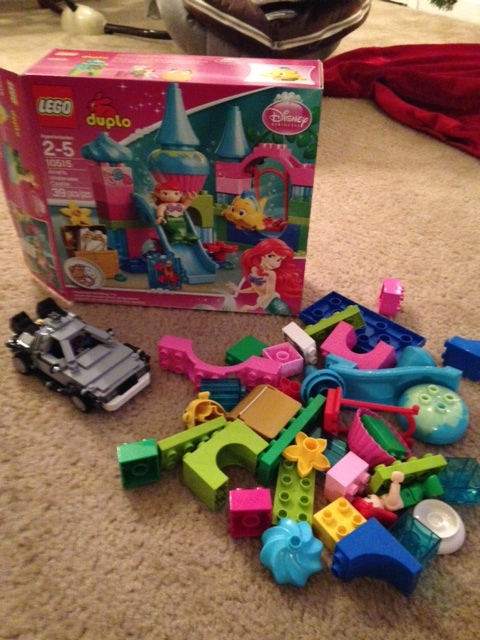 One of the greatest things that Sophia has gotten into this winter is LEGO. AND I AM SO EXCITED I CAN’T EVEN TELL YOU!! I have a bucket of old LEGOs in the basement that she’s started playing with. We bought her her very first set at the LEGO store (and I may have gotten the Back to the Future DeLorean for myself…) and she loves them. Granted, she tosses them around when I’m trying to put mine together or she’s putting her own together. We also went and saw the LEGO Movie. And let me tell you, it was AWESOME. She may have not liked it as much as she loved Frozen, but she had a ball seeing the movie. So much so, that she wants to see it again. I love watching her get into the things that I was a fan of as a kid. It’s fantastic to see. I didn’t know if it would happen or not when I had kids. If they would like the things that I liked when I was a kid. But it’s happening and I couldn’t be happier about it. 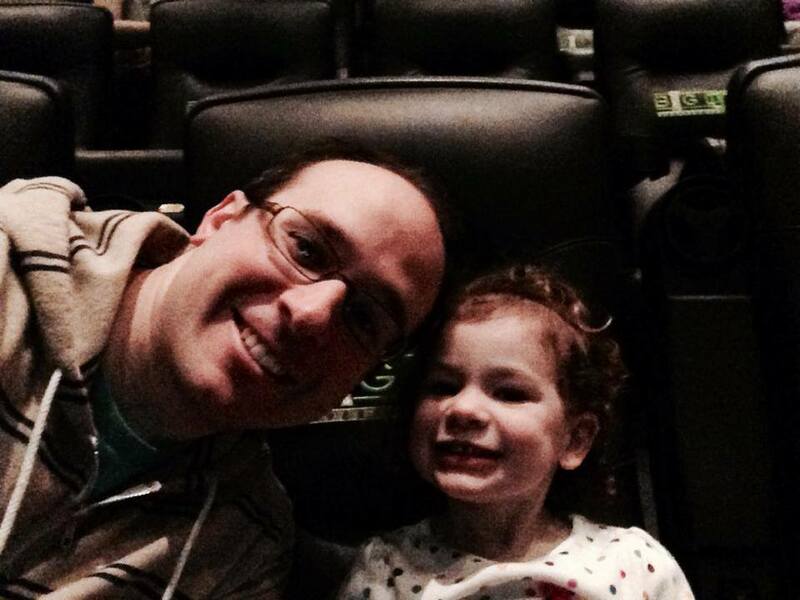 Sophia and I at the LEGO Movie. The other thing that has started happening quite a bit recently: the baby laugh. Maddie is starting to laugh at a lot of stuff. Her laugh is hysterical. At least to us it is. I’m sure every parent thinks their kids have the best laughs, the best smiles, the best looks, but seriously, her laugh is the best. You can see it in the video below. It’s hard to believe that my little (I use that phrase very loosely) Mad Dog is already six months. And, she’s already closing in on Sophia’s weight. I have one child who is a stick and one who is a tank. I didn’t see that one coming! You can also see Sophia building a snowman for me. Her first attempt wasn’t bad. Yes, the winter has been rough. I’m glad Lego has helped out.